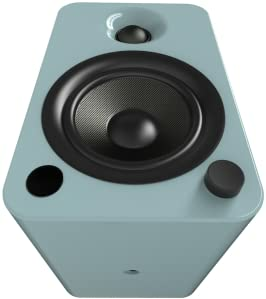 REMARKABLE SOUND – Enclosed in handcrafted MDF cabinets measuring 8.7" tall, YU4’s 1” silk dome tweeters and 4” Kevlar drivers deliver crisp highs and wonderfully balanced mid-range, faithfully reproducing all your favorite tunes. EASY STREAMING – Built-in Bluetooth with Qualcomm aptX technology lets you enjoy high-quality streaming from the palm of your hand. VINYL-READY – Equipped with an integrated phono preamp, YU4 can be easily connected to any vintage or modern day turntable. SIGNAL DETECTION – YU4 features automatic standby and power-up modes, helping to conserve power when you’re gone and ensuring you never miss a beat when the music starts playing. REMOTE CONTROL – With volume, input, tone and balance controls, as well as playback options when using Bluetooth, the YU4 remote gives you full control over your audio. Music is made to be shared. Whether you’re hanging out with friends or kicking it solo, YU4 ensures you’re always in good company. Producing 140W peak power, its Class D amplifier effortlessly fills your room with rich, spacious sound. Carefully designed 4” Kevlar drivers and 1” silk dome tweeters faithfully reproduce your favorite tunes, letting you enjoy them to their fullest. Packed with connectivity, YU4 makes it easy to throw on your latest vinyl with a built-in phono preamp, or sit back and stream your carefully curated playlist via Bluetooth. Crystal-clear, detailed sound for all to enjoy. Built-in Bluetooth with Qualcomm aptX technology lets you enjoy high-quality streaming from the palm of your hand. Equipped with an integrated phono preamp, YU4 can be easily connected to any vintage or modern day turntable. Enclosed in handcrafted cabinets, YU4’s 1” silk dome tweeters and 4” Kevlar drivers deliver crisp highs and wonderfully balanced mid-range, faithfully reproducing all your favorite tunes. 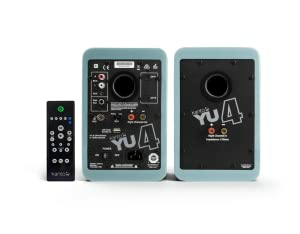 YU4’s user-friendly interface features a single knob. Simply rotate for volume, push in to cycle through the five inputs, or push and hold to activate and deactivate standby mode. YU4 features automatic standby and power-up modes, helping to conserve power when you’re gone and ensuring you never miss a beat when the music starts playing. With volume, input, tone and balance controls, as well as playback options when using Bluetooth, the YU4 remote gives you full control over your audio.